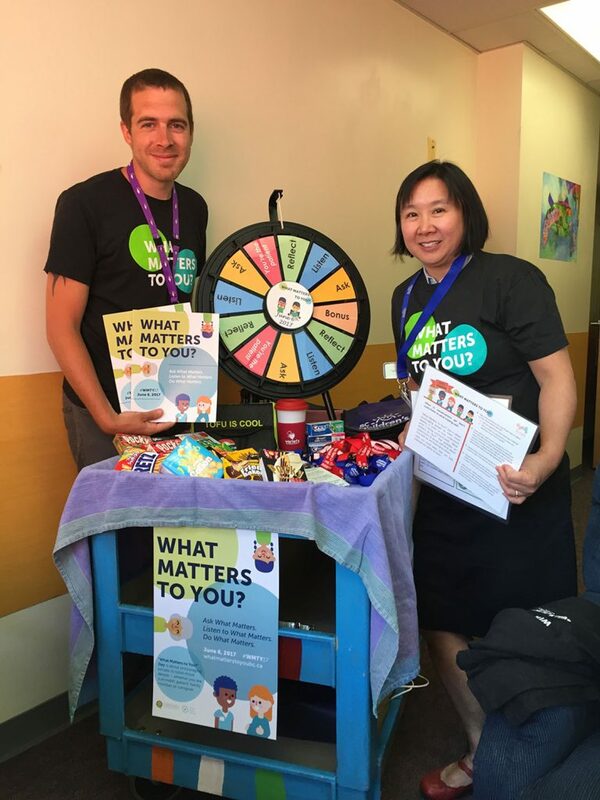 With International “What Matters to You?” Day coming up tomorrow, we checked in with Leslie Louie and George Wallbank, two staff members at Sunny Hill Health Centre for Children in Vancouver, to find out more about their “What Matters to You?” activities last year. 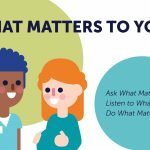 After they shared the poster they created for the 2018 Quality Forum with their lessons learned, we are looking forward to seeing how they are celebrating “What Matters to You?” for the rest of the year! Leslie and George have been very excited to spearhead the “What Matters to You?” initiative in the workplace. With a big upcoming change as an institution – they are moving to the BC Children’s Hospital site in Vancouver in 2019 – senior leadership at Sunny Hill decided to keep the dialogue open throughout the whole year, for both staff and patients, to help with the transition. Sunny Hill also wants to continue the momentum from last year’s successful campaign. During the lead up to “What Matters to You?” Day 2017, Leslie and George walked the halls at Sunny Hill with a cart of candy and chocolate to get everyone excited about participating. Most importantly, they wanted to keep the activities informal and fun (and treats never hurt!). Participants spun a colourful prize wheel and were asked a “Listening”, “Acting”, or “Reflecting” question. In addition to this outreach around the hospital, staff were encouraged to ask “What Matters to You?” to the families they worked with. George and Leslie both said that, for some hospital staff, it is not always as easy as one might think to ask families outright “What Matters to You?”; it takes work to get the approach right. Staff often reframed the question and found different ways to embed it in the conversation, sparking a longer and more engaging dialogue with patients. The question was never meant to be a formula for patient engagement, but a starting point, as Sunny Hill staff have demonstrated by making the question their own. Leslie shared that culture change with a health care facility such as Sunny Hill will not happen overnight, but said that they have started reminding staff on a daily basis to consider the question and that the phrase “What Matters to You?” is always in displayed in a visible place for staff as a reminder. This is a great way to start making lasting shifts in organizational culture. From their experience with WMTY, the staff at Sunny Hill learned that even smaller gestures go a long way with families. After receiving feedback during WMTY last year, Sunny Hill began their commitment to serving complimentary coffee in every waiting room. One patient said that “on a busy day like today, coffee was very welcome”. Something that seems as simple as a cup of coffee is the start of something bigger; it takes baby steps at first. The staff at Sunny Hill are still working on addressing more of the stories that came up last year. George said that one comment really stood out to him: a participant wrote “There is no name for autism in my language and culture. How do I talk about it?”. This highlights the need for more culturally competent care and a range of language resources for patients and families. 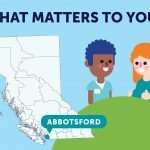 “What Matters to You?” is bringing these types of patient concerns to the forefront. As they prepare for this year’s day of celebration, Leslie remarked that the Patient Voices Network resources were vital for the staff’s promotional efforts last year. The bookmarks, lanyards and stickers kept the question at the top of mind for both staff and families, and using cards with prompts like “Listening”, “Acting”, or “Reflecting” enables Leslie and George to create fun games for participants. They’re getting the cart ready to go again and both George and Leslie are looking forward to comparing their results between this year and last. What they learn will help them get a bigger picture of how the question of “What Matters to You?” continues to impact staff and families at Sunny Hill. This entry was posted in Health Care Partners, Success Stories and tagged Health Care Partners, What Matters to You. Bookmark the permalink.